Fruit salads are traditional for the late-night dinner enjoyed in Mexico on December 24, and this one is one of the very best. Consisting of a colorful combination of fruits and vegetables bathed in a light dressing, Mexican Christmas Eve Salad is beautiful, healthful, and delicious. This very easy recipe has many steps, but many of them consist simply of peeling and slicing the ingredients. The recipe is, in fact, so easy that it is appropriate even for the least experienced of cooks. Though the salad does not keep for very long once it has been put together, the fruits, vegetables, and dressing can be prepared a day ahead and assembled at the last minute. Serve this salad as they do south of the border, as a first course at a holiday dinner (Christmas or otherwise); your guests will be delighted. If you are using fresh beets, wash them well and boil them in enough water to cover them for 30 to 40 minutes, until a fork inserted all the way the center goes in easily. Take the beets out of the water, peel them, and cut them into slices of about 1/3 to 1/2-inch each. If you are using canned beets, drain them. Keeping them whole, wash and dry the romaine lettuce leaves. Leave the smaller leaves intact; cut the larger ones in half. Peel the jicama and cut it into slices the same width as the beets. If you have fresh pineapple, peel and core it, then cut into slices. If your pineapple slices are canned, drain them. Leave the apple peel on for color, or peel the apples if you prefer that. Cut them into 6 to 8 wedges per apple, discarding the stem, core, and seeds. Squeeze the lime halves over the apples, then toss them so that the juice with cover all exposed apple surfaces and prevent them from turning brown. Peel the orange, taking off as much of the white part between sections as you can. Separate the orange into wedges. Open up the pomegranate and remove the seeds, discarding the peel and tough white membranes. Pick the cilantro leaves off of the stems. On a large tray or on individual salad plates, place all of the fruits and vegetables in an attractive arrangement. For example, start with the lettuce on the bottom, then build layers of the rest of the ingredients in contrasting colors. 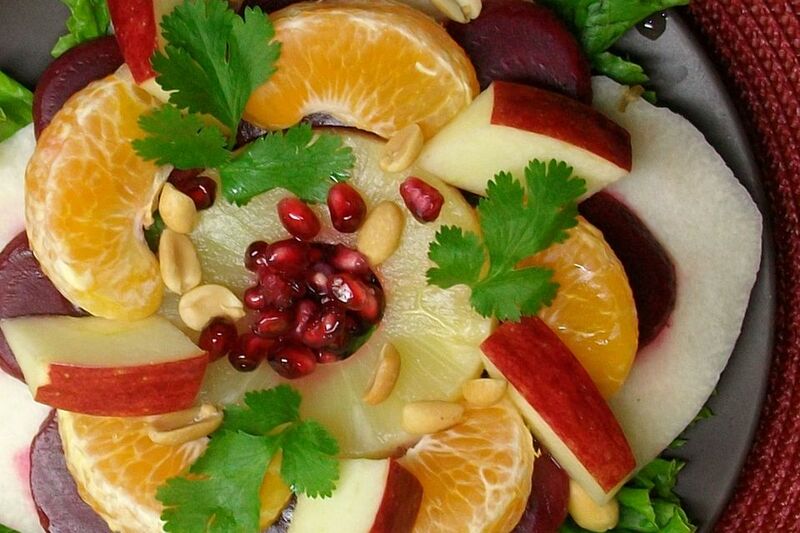 Sprinkle the pomegranate seeds, peanuts, and cilantro leaves over the top. Bring the pitcher of dressing out of the fridge so that each diner can pour a little of it onto their salad once it is served.